Later this month, Seton Hall will hold its annual business ethics breakfast and the breakfast will feature hall of fame basketball coach Bob Hurley Sr. Hurley will speak on the themes of ethics, leadership, and the importance of teamwork on March 23rd. The event will be open to faculty, students, and friends of Seton Hall and attendance must be RSVP by Friday, March 18th. 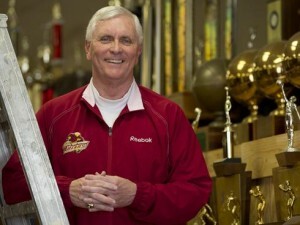 Bob Hurley Sr. is a native of Jersey City, New Jersey and began coaching at St. Anthony High School in 1972 and continues coaching there today. Hurley has compiled quite a resume during his long tenure at St. Anthony that includes five undefeated teams, 28 state titles including nine in a row from 1983-1991, and four national titles. Along with those accomplishments, Hurley has also won over 1000 games as a coach and became only the third high school coach to be inducted into the Naismith Basketball Hall of Fame. Hurley has also had five NBA first round picks play for him including his son Bobby Hurley who won two NCAA National titles with Duke and now is the head coach for Arizona State. Later this month, Seton Hall will hold its annual business ethics breakfast and will have one of the greatest high school basketball coaches of all time, Bob Hurley. The event will look to have a great turnout and will be held March 23rd. Hurley will speak about the themes of ethics, leadership, and the importance of teamwork that has worked so well during his over 40 years of coaching. If your company is interested in finding out availability and booking fees for a hall of fame basketball coach such as Bob Hurley or other sports celebrities for a Keynote Speech, Fundraiser Event, Guest Appearance, or Football Camp, call us at 1-888-246-7141.